Due to the rising cost of meat, I don’t make large cuts of meat as often as I used to (I’m more of a casserole, soup, stew, pasta person). 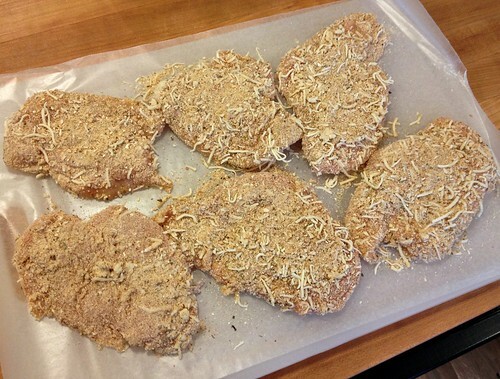 However, my recipe for Chicken Parmesan uses chicken breasts that are cut in half crosswise so they are very thin. 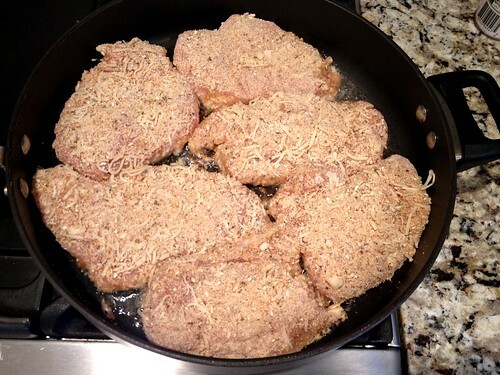 Because of this, I can get 6 good-size servings from 3 chicken breasts AND the thin cuts cook faster so the crispy coating doesn’t burn before the insides are fully cooked. Oh, and it’s a one-skillet meal, meaning less dishes to wash and no oven required. 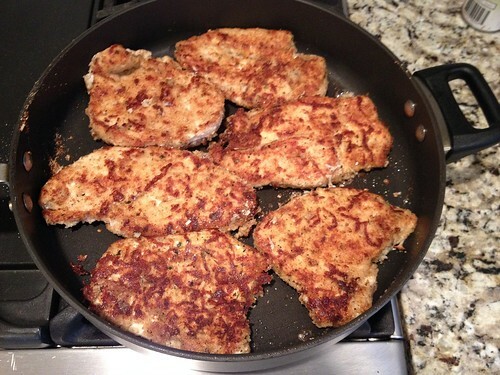 ** Note: if you use Italian bread crumbs, you probably don’t need the seasonings. 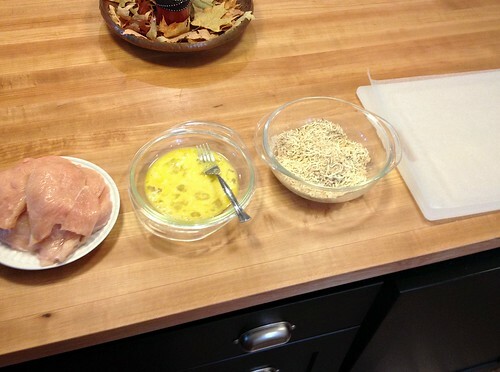 Top each breast with another Tablespoon of cheese. 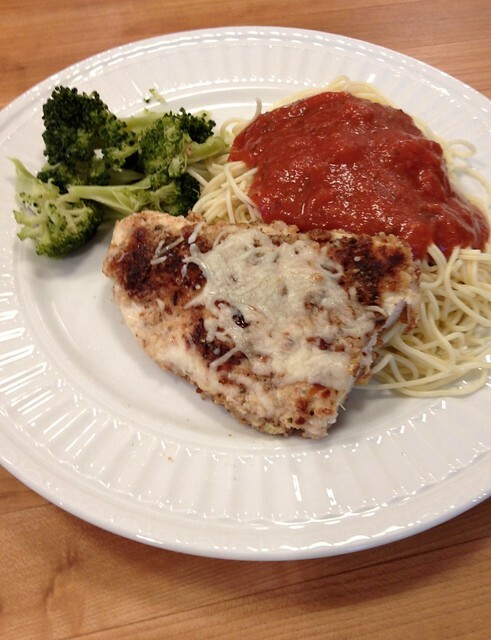 I’ve seen Chicken Parmesan served with pasta, rice, potatoes, or just veggies and a salad — so whatever you prefer. I made one 16 oz box of Angel Hair pasta and this pasta sauce (with added canned tomatoes). We also had broccoli, applesauce, and garlic bread to round out the meal. Any type of chicken and any type of pasta are always BIG “winners” in our house — which is probably why this is one of our favorite meals. 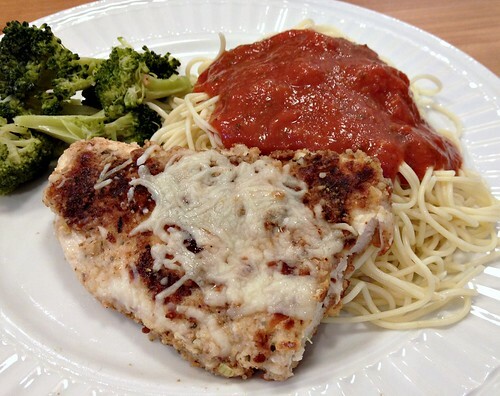 Oh, and I should mention that although almost all the recipes I’ve seen for Chicken Parmesan involve simmering the already cooked chicken in pasta sauce, I purposely do NOT do that as it makes the crispy chicken breading super soggy. 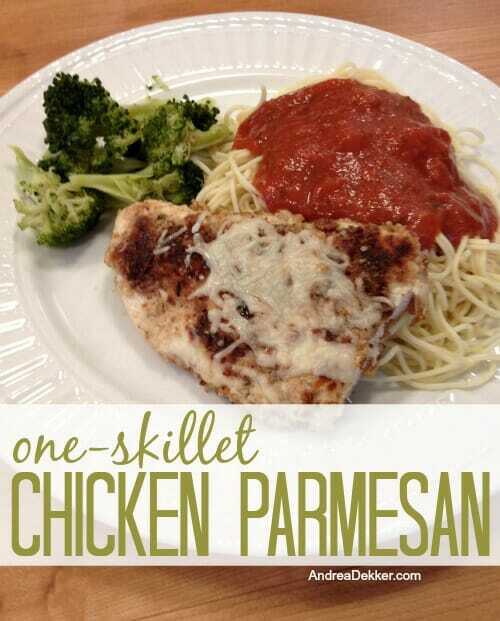 I made a version of this for dinner the other night despite not having parmesan cheese…used shredded cheese instead and it was easy and yummy! yay — glad you guys liked it too! I have a version where you line a baking pan (like a 13×11) with foil and bake in a hot oven – say 400 or even 450 and turn the breasts after ten minutes, then continue to cook on the second side for ten more. The last side up is the pretty side. I totally fail at slicing breasts that way so I pound them to about 1/2 inch and then cut them in two. They cook a lot faster that thin, which is how I get away with the ten min. per side. 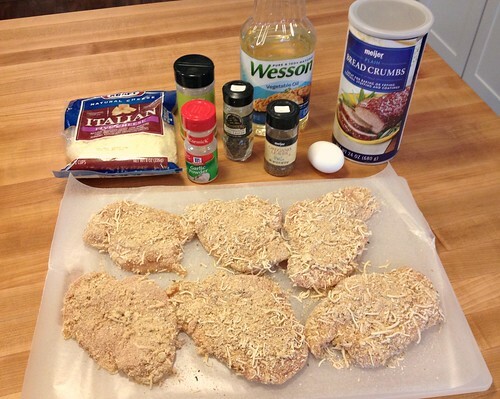 I also do the same with McCormick’s Mexican seasoning – coat the smashed breasts in a generous amount of oil, then sprinkle the seasonin on and cook as above. No eggwash or crumbs involved. I make bread crumbs from stale gluten free bread, since we are a wheat free home, and I use either coconut oil (the extra refined version with no taste) or palm oil, since we are a seed oil free home. I don’t use olive oil at high temps – smokes too much. I also make my own mayo with olive oil and sometimes roll the chicken in mayo (which basically is egg plus olive oil with some lemon and vinegar added) and then roll in cheese. I love these super easy suppers that take no time at all to cook and clean up. BTW – we use spaghetti squash or zoodles instead of pasta. You cannot tell its not pasta, seriously and even if I were tempted to eat wheat the after effects would have me regretting it immediately. Sounds yummy Liane! And I totally need to try spaghetti squash. I know it’s so much healthier than eating pasta (and I love my pasta). I think making that one switch in my diet could save me hundreds of calories! I would like to print out this recipe without all the pictures, but it is not in your recipe box. Will it be there after this post? I thought the recipe box might just have the recipe and not all the pictures of the steps. Thanks! 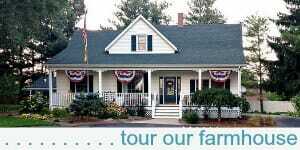 It sounds scrumptious! 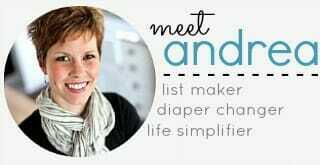 Hi Judy, All you need to do to print any of my recipes without the pictures is to click on the “print recipe” link right below the recipe title. That should open a Google doc. that will be easy for printing! 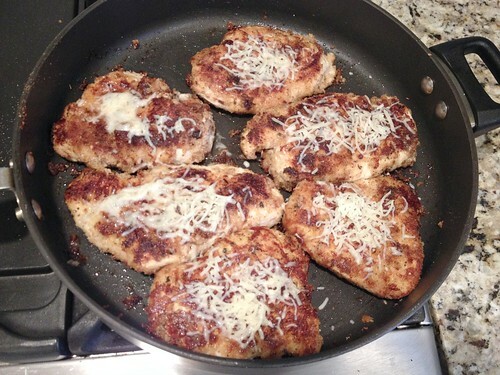 I make an almost identical chicken parm. 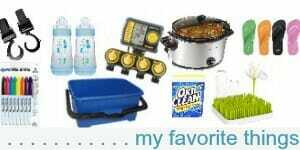 My family loves it and it so quick and little clean up. Great recipe. My daughter got it in high school home ec about 4 years ago. I can’t wait to try this one. I love when you do recipes! Thanks Abbie — hope you love it! I can’t wait to try this! I always thought this was a hard and complicated dish to make. It seemed like to many steps. Reading this one dish version was exciting! Lol! Thanks for all your super simple recipes! Shelly, I usually use Italian blend cheese, which has fresh parmesan in it. I like the taste of this and I ALWAYS have this cheese in the freezer. I rarely ever have the powdered shaker parmesan in the house — so I guess I don’t ever use that kind. I will say that although the fresh parmesan is more expensive — it really does taste A LOT better 🙂 Maybe try the Italian blend cheese as a cheaper alternative first?? ?